Zaxaty: My magic ability was art. I was the best painter, sculptor, composer, poet, you name it. Zaxaty: I used to be the leader of a community of creative minds! Now I'm just a leader of my own failures. Zaxaty: What's a roller-discoing governor princess supposed to do to stand out in this world if she can't paint? being able to crush marble in an instant is pretty unique on its own, zaxaty. Oh no so shes the opposite of the king in terms of self esteem lolol, hey that roller blade in the shower thing is a cool party trick at least! If it's such a unique question, it may help her stand out in the world! If she can't stand out with success, she can stand out with failure. you're saying she should write, direct, and star in this universe's version of the room? Ha ha ha. What a story, Mizuki. Yup. It's difficult being normal again. 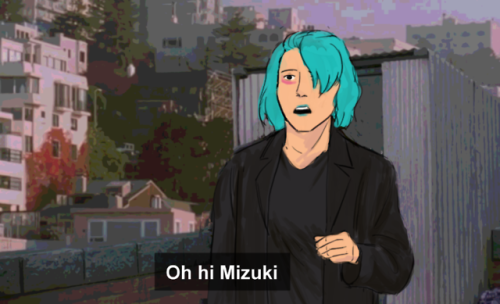 So here, you and Mizuki's interest are aligned. Open the portal, have your magic back.